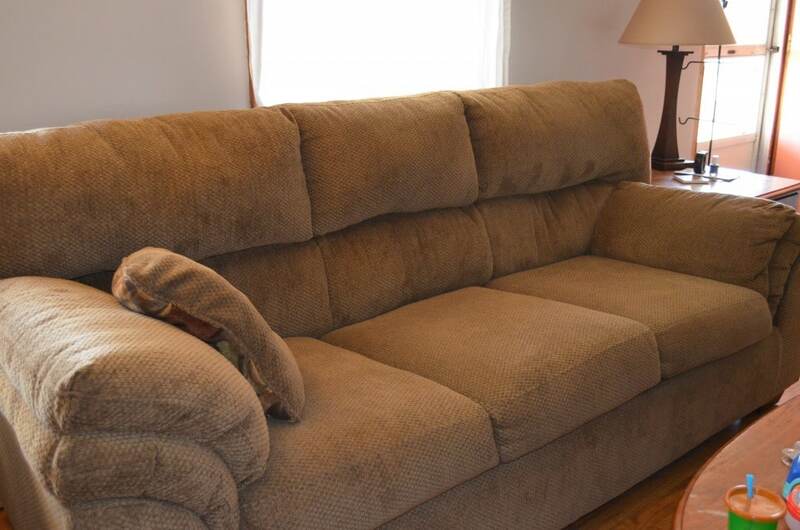 Here is the couch before. And there is one of the pillows that also got a makeover. And this photo is totally unedited. I got tired of editing after the pretty ‘after’ shots and just left this one alone. You will want to hurry past it anyway to get to the good stuff! Couch covered, chair covered, pillows covered, ottoman covered. Viola! New Living Room! I was so tempted to keep that ottoman! I must make another sometime. Anyone need an ottoman makeover? So if you have a couch or chair or ottoman or love seat or any piece of furniture that you don’t love the look of but can’t afford to replace, consider a custom made slip cover. If you want to make your own got to Miss Mustard Seed’s blog and watch her video tutorials on slip covering. You CAN make a slip cover if you are on speaking terms with your sewing machine! 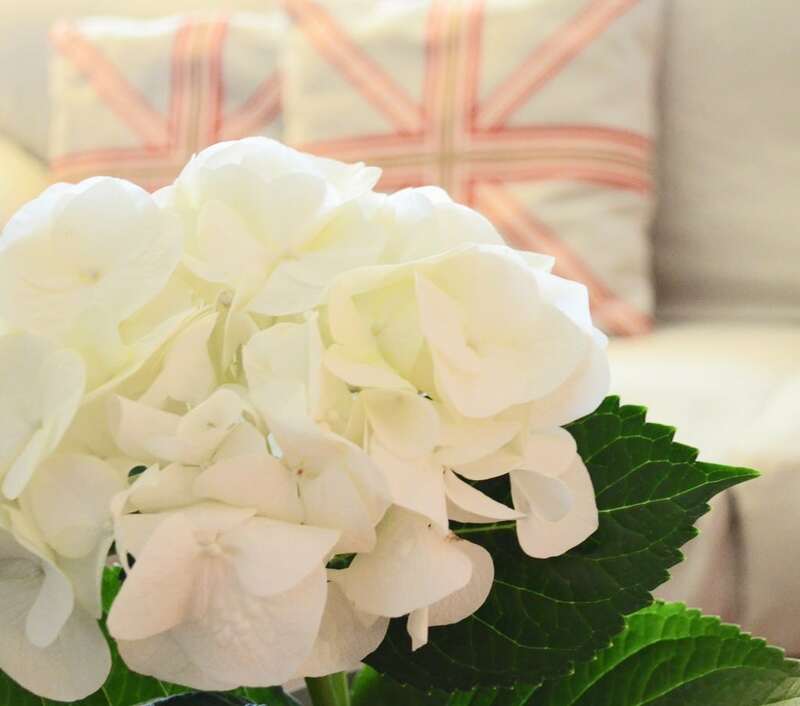 Back to the Union Jack pillows – I got a lot of complements on those. Later on today a blog friend of mine is doing a giveaway for one of these pillow covers! So you will want to check that out and enter if you like red and the union jack! I will post about it in a whole new post so watch for it!!!! It looks beautiful! Well done! Thank you Mandie! post with your pillow cover coming up soon! Thank you Britni! It was a really fun one to make! I have dreams about a slip covered sofa, I’ve check out the tutes and there is no way in my lifetime this is going to happen with my sewing skills. If I measure my sofa and send you the details……..haha. Love it all! 🙂 Sarah, a couch is a bigger deal – I’d recommend starting with a chair first! I wish I could make these just from measurements but, alas, I’m just not that good at it – I have to have the piece of furniture on site! VERY cute… that living room has SAFS written allll over it! Does Liv know that if she leaves the room, she may return to find you’ve painted her coffee table white? Thanks Sue! I emailed you about the time and date of the paint workshop. if it suits i’d love to try to come! Thank you Katie! It was fun to pull this all together! After seeing the work in progress( and loving it!) I’m so glad to see the finished project now. It looks GREAT!!!!!! Thank you Diana – it was a fun project to work on – the ottoman is darling isn’t it? i was so happy with how it turned out! Wow. That was a beautiful transformation. It’s so much brighter, cleaner and it makes the room look so much bigger. I am sure she is loving her new living room. What a great job. Thank you Amy! it made such a difference! She has more plans in the works too – I hope she will share some pics with me once she has her floors refinished and some more painting done! Looks great, you’ve done an outstanding job! I bet she is one happy camper too! Thanks Tania! I think she liked it quite a lot! Thank you Sherry! The homeowner was happy so I call it a success! oh my lord have mercy. that ottoman is awesome. everything looks so great! i added my follow by email button back…must have gotten lost when i changed the blog design around! happy monday to you! Thanks Ali! and thanks for putting the email subscription back on – I just signed up! My email subscription just went all wonky on me and I had to completely redo it and all I had done was move the widget. You never know! Oh my goodness, I bet she is beyond thrilled! What an amazing transformation of her room! And, yes you need to make yourself an ottoman! Thanks Pam! She was very happy:) She plans to start some painting and floor refinishing projects this fall and I would love to photograph it again when she has that finished! so adorable!!! (I really resisted writing ‘sew’…wait. I just did. oh well.) Love those pillows, and especially the pouf. I’d love two of those for my living room 🙂 Do you know what the base was for it? Saw you at Make It Pretty Monday. Can’t wait to see what else you have for us. Nice to meet you! heehee! SEW nice of you to leave such a sweet comment 🙂 The pouf was just an old ottoman that my friend found on ebay! 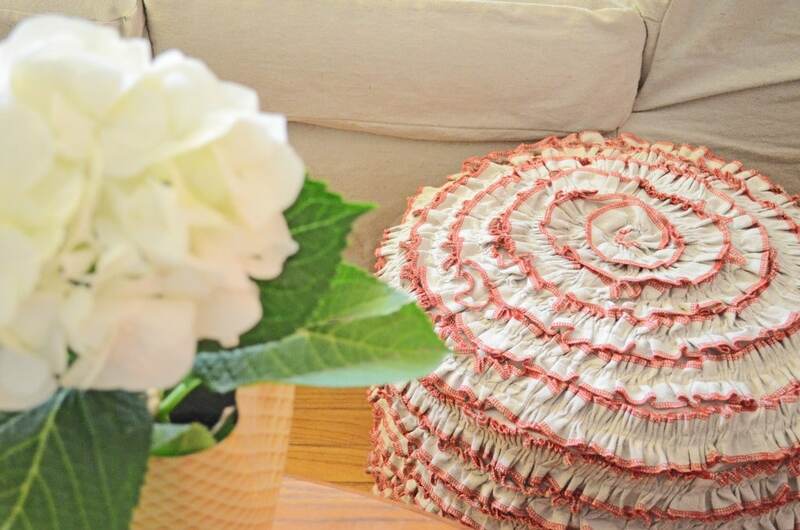 Search your local thrift shops and second hands stores – then make a couple ruffled slipcovers!! 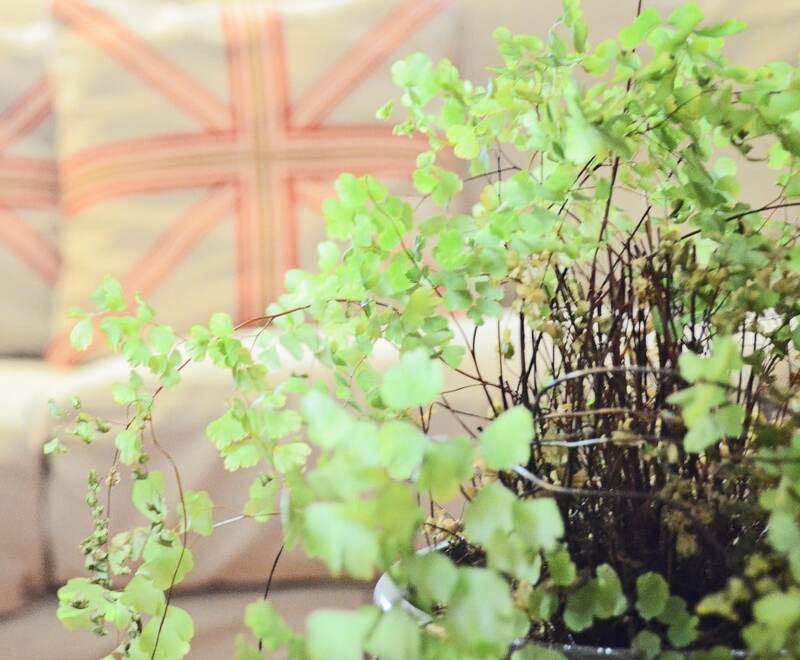 Thanks for commenting – I just check out your blog and it is just beautiful! Thank you Diedre! It is fun to see it come together! Thank you Mary Beth! It does look like a fancy cupcake doesn’t it!! Thank you Rita! These were very fun to create! Thank you Julie! It was a fun makeover! Wow, great job on the slipcovers! Love the ottoman and pillows too. Thank you Elizabeth! They were very fun to make! The ruffles are serged on both sides with red thread first, then ruffled up with my ruffler that attaches to my machine. Then I just sewed it on – around and around and around!!! I am not on good terms with other tools because my hubby thinks they are only HIS tools and HE will do that kind of stuff for me! His time frame and mine don’t always coincide though! Thanks Bonnie! My client loved it too! WOW!! And I mean WOW!! And I want the ottoman!! Thank you Christine! It turned out cuter than I even pictured it! Gorgeous makeover! I am so impressed… I’m not sure I could ever have the skills and patience required to make a slipcover, although I do love the results. Maybe one day! I love the pillows too. Thank you! Slip covers are not as hard as they look but I would recommend doing a chair or stool first! You did a really beautiful job. I will be featuring this tonight at my Sizzle into Summer party that opens at 8pm EST. Please stop by and pick up an I’ve Been Featured button. Thanks. This is just so adorable, and I cannot believe that ugly couch is hiding underneath that fabulous slip cover. I need that Ottoman!!!! Any chance you might be sharing a tutorial on it in the near future?????? If you do, I would love to feature it on Redoux, it is just so fun! I am featuring all of this cuteness tomorrow, thank you for sharing! Aw Karen, that is so sweet of you! It is amazing what a slip cover can do isn’t it! i do plan to make another cover similar to this one and I can do a tutorial when I do that! Got to find another round ottoman at a thrift store! Thank you Tamsyn! This was a fun one – it turned out so much cuter than I even pictured! 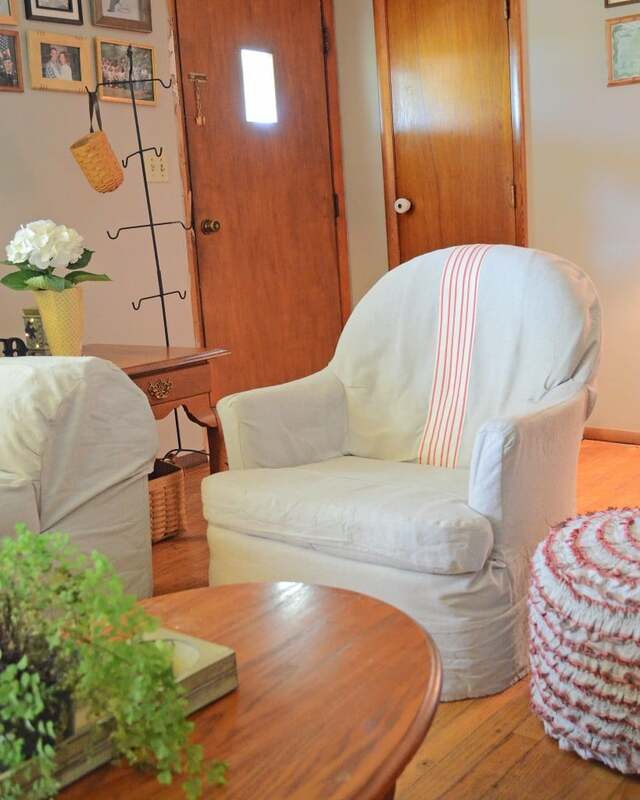 Hello Jill: What a beautiful transformation of this room! 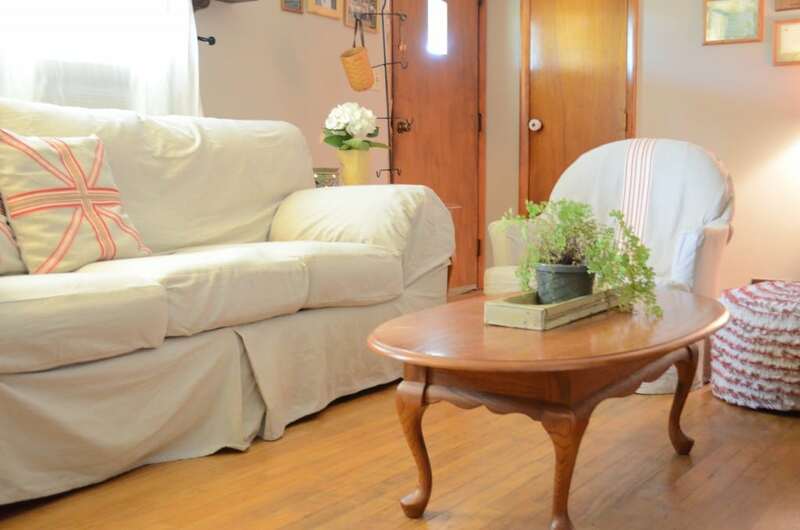 Love the new look of the couch, and I am so coveting that ottoman. You’ve done such a good job with all of the projects that made up this wonderful new room! Thank you Athena!! It really is a wonderful room now! Wow! What a change! Beautiful job. Wow! What a change! Beautiful job. I’m so glad you linked this up at One Creative Weekend! I love it! I’d love for you to join the party again tomorrow. Thank you Heidi! It was a fun redo! It looks fabulous! Your did a great job and the transformation is amazing! That ottoman falls into the “too cute!” catagory! Love it! Would love for you to link to Potpourri Friday! Thank you Honey! I love that ottoman too – must make another one! I linked up over on your blog – thanks for inviting me over – always fun to meet new blogging friends! omg love! now i have to check out your etsy shop and find out where you are located. i can’t sew and always need that service! looks fabulous. found you via MMS’s party where i’m partying too. would love to have you as a follower. Thanks Michelle! I would love to sew for you – I’m in Ohio but shipping always works if you are not in my area! I checked out your blog and I followed you back! Love what you have going on in that living room! That ottoman is so sticken cute!!! Holy cow! I love the ruffles!!!!! Thank you Deana! I love it too and must make another one soon! Thanks for sharing your lovely project at Potpourri Friday at 2805! Thanks for inviting me over Honey! I am so very impressed! You did a wonderful job on each and every project in this room. I’m sure your friend is so pleased! I adore that ottoman! I went back and took a look at your other ottoman posts as well. Thanks for sharing all the info. I love this look and am putting this one on my hope-to-do-soon list! Visiting from 2805. Thank you Sonya! The ottoman is really super easy if you like to sew 🙂 I hope too you make one soon – it’s fun that this inspired you! Thank you Danielle! My friend was happy with her new look and I had fun doing it! Glad it is an inspiration to you! This is gorgeous! You are so talented! 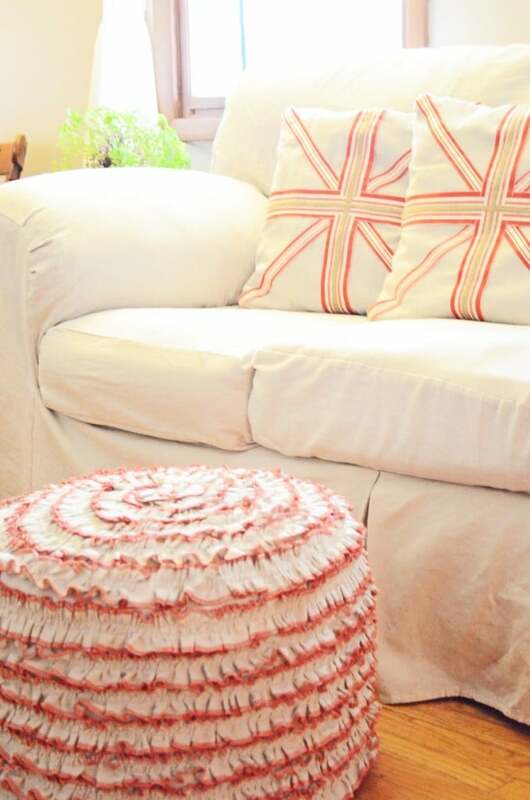 I love the pillows and the ottoman is so cute! I’d love for you to share this at my Twirl & Take a Bow linky party at http://www.houseontheway.com. It would make an awesome addition to the party! Hope you can stop by and join in! Thanks Leslie! I’ll be over to check it out! Hi! Just in case you haven’t seen the news, you have been featured at Potpourri Friday at 2805! Thanks Honey! I did just see that! Thanks! That ottoman is fabulous……..thank you for sharing! Thank you – I was happy with how it turned out! And it was fun to make! Love the ottoman thank you for sharing! Thank you Kat! Fun to know where you found me and that you liked me well enough to follow along! I’ll be over to your blog too! This is beautiful, I’m going to try and make your cushions! Good for you Jan! I know they will turn out beautifully – they are really simple to make! Drop cloths for the base and torn strips of fabric and ribbon for the ‘jack’! !